The rumours are true! After a previous fake press release, Lionsgate have confirmed the news in an official release, detailing plans to debut the new trailer for Catching Fire, along with a cast panel on Saturday 20th July at Comic-Con. "LOS ANGELES – June 26, 2013 – Lionsgate announced today that Fandango Chief Correspondent Dave Karger will moderate a panel on Saturday, July 20th at the San Diego Comic-Con, featuring talent and exclusive footage from two of the studio’s upcoming filmsTHE HUNGER GAMES: CATCHING FIRE (opening November 22, 2013, the film stars Jennifer Lawrence, Josh Hutcherson and Liam Hemsworth) and I, FRANKENSTEIN (opening January 24, 2014, the film stars Aaron Eckhart, Yvonne Strahovski and Bill Nighy). Talent from both films will be in attendance for the panel during which the studio will debut an exclusive new trailer for THE HUNGER GAMES: CATCHING FIRE and never-before-seen footage from I, FRANKENSTEIN." Fans can also submit questions for the cast members and director Francis Lawrence to answer during the panel. 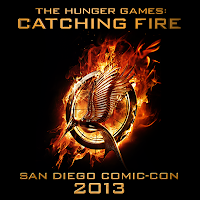 This can be done through the official Hunger Games Facebook page using the hashtag "#CatchingFireComicCon". More details from Fandango. Use the Twitter hashtags: #CatchingFireTrailer and #CatchingFireComicCon to join the conversation. "I, Frankenstein stars Aaron Eckhart and Yvonne Strahovski appear with film director/writer Stuart Beattie and graphic novel author/writer Kevin Grevioux. Plus, the cast of the highly anticipated second installment of The Hunger Games: Catching Fire comes to Hall H for the first time. Panel moderated by Fandango chief correspondent Dave Karger. Never-before-seen footage is showcased from both films. Includes Q&A opportunity." Let us know what you're looking forward to seeing most!